If your weary powder legs can handle a little more vert, we have one more race for you this Tuesday night 3/5. This week’s course will have 2 loops for you to ski around for a points-based race. 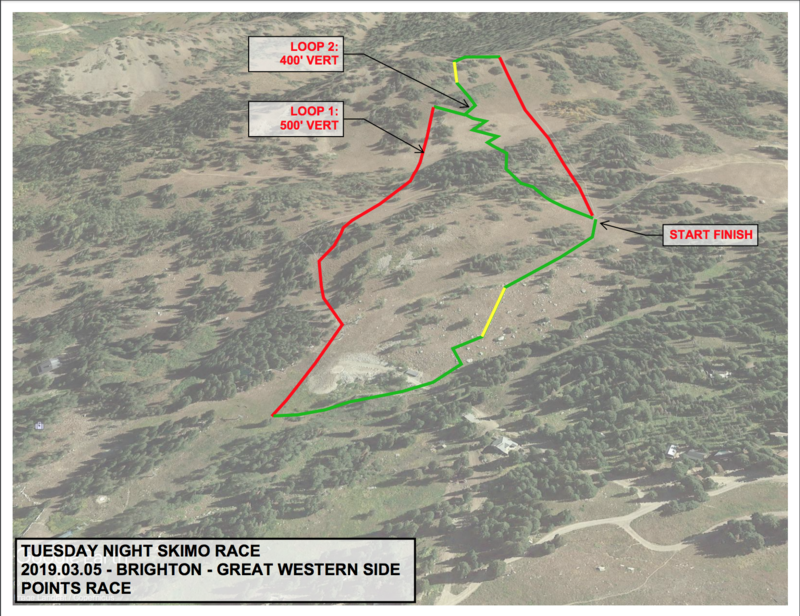 The race will start at the first big flat area as you are heading up the Great Western lift. 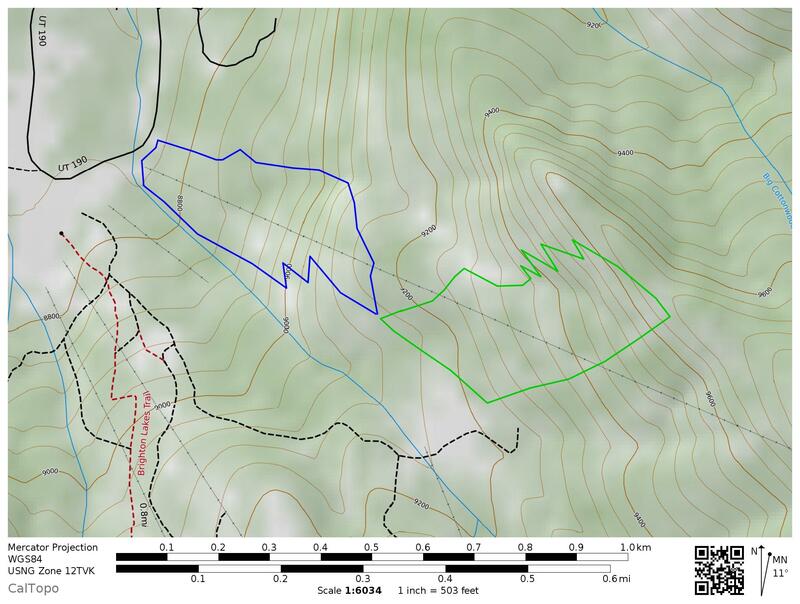 The right hand loop will be punchy while the left hand loop will be a little longer and feature more off-trail skiing. See how many points as you can rack up in an hour. Please remember to park at Milly Chalet and walk over to check in near the base of a Great Western lift. The start will take about 10-15 minutes to skin to so allow your self some extra time. Start time is 7pm sharp! As always, there will be prizes and a raffle at Alpine Rose afterwards. You don’t want to miss this one; we will be raffling off a pair of Dynafit Speedfit 84 skis! 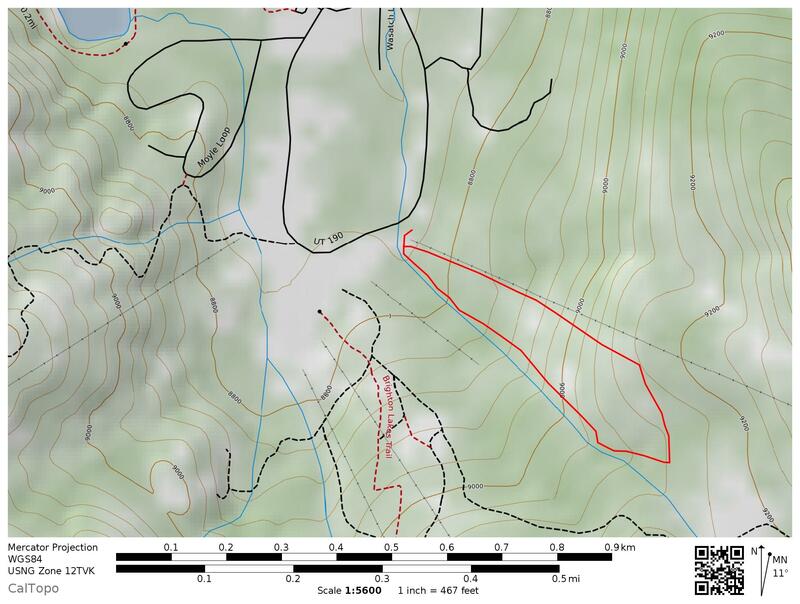 Make sure you park over by Milly chalet and that you have signed the waiver for Brighton and the Utah Skimo waivers for either adults or kids. Don’t forget your helmet and headlamp! This week we will be back on Western where we have a shorter multi loop course. We will do two “dog ear” loops which will equal 1 lap. The race is any many laps as you can do in the hour. Afterwards, we will be going to Alpine rose for food and awards. It s going to be a cold one so bring extra skins and layers. We don’t currently have enough volunteers to put on a race this Tuesday, so unfortunately it may have to be canceled. If you or anyone you know can volunteer to set course or help with check-in, we’ll all get to have another fantastic race! Please sign up here to help us get this race off the ground! This week’s race is a short loop with a short booter. 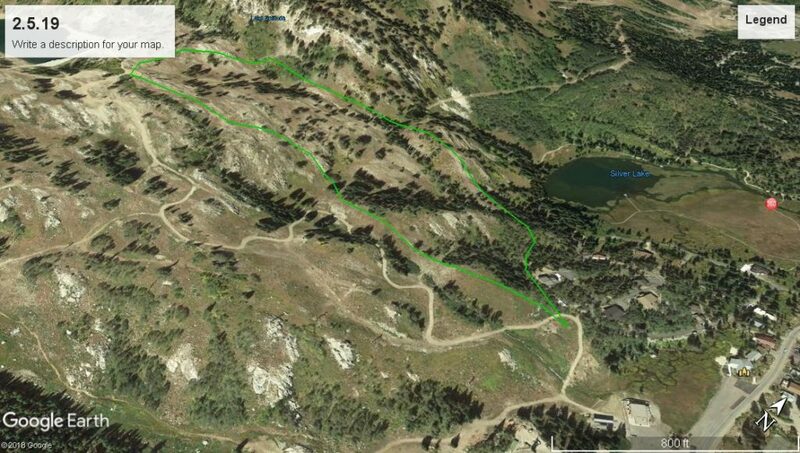 The loop will start and finish near the bottom by the Milly chalet. 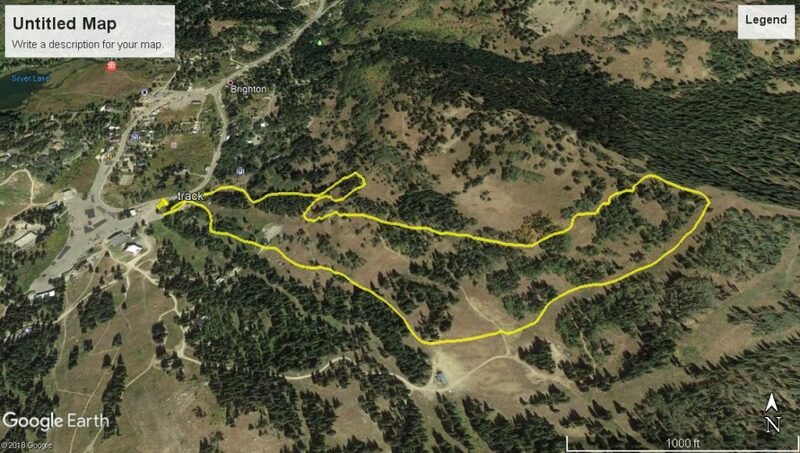 From the start, the course will be a skinner up into the trees of Evergreen. Once part way up the rope line, there will be a short booter. From there, we will skin to just underneath the Twin Lakes dam. The race will then descend back down to the start/finish. There will be some tree skiing, open runs, and lots of POWDER! This course was set by our third guest course setter Sarah. You too can come up and design your own course. We also need help with check in and course setter helpers. Remember these races don’t put themselves on! We need lots of help to make them happen so sign up here. Race time will start at 7pm sharp! Alpine Rose is open for us to have an after awards party. We have some great prizes and give aways from all our great sponsors Dynafit, Skimo.co, DPS, Gnarly Nutrition, and Voile. If you have not got a Skimo season membership, then make a $10 donation on the website before you come up and save yourself some time. All proceeds go to pay for the races and help support Utah Skimo. This week’s race encompasses a big loop with a quick downhill section close to the start and two booters. The loop will start and finish at the bottom of the Great Western Express lift. From the start, the course will be a skinner up into the trees of Elk Park. Once it flattens, there is a transition to a quick downhill to the lift. From there, it’s skinning and booting in the lift line until the course peels towards the ridge with another booter tucked in the middle. Finally, there’s a steep descent in soft snow on Rockin’ R, then a groomer to the bottom of the lift. This course was set by our second guest course setter Logan. You too can come up and design your own course. We also still need lots of help for the remaining races for check in and course setter helpers. Sign up to volunteer here. The race will start at 7pm sharp! Alpine Rose is open for us to have an awards party afterward. We have some great prizes and give aways from all our great sponsors Dynafit, Skimo.co, DPS, Gnarly Nutrition, and Voile. The 17th Annual Wasatch Powder Keg is coming up soon! Thanks to dedicated volunteers, continued racer enthusiasm, and the generous support of many outdoor manufacturers and retailers, the Wasatch Powder Keg remains one of the largest ski mountaineering (skimo) races in the US and it continues to grow! The Wasatch Powder Keg will be held on February 23rd and 24th. This year’s race will host a pre-race meeting Friday night. Saturday will be the traditional Powder Keg Individual Race. Sunday will feature a Vertical Race. We’re looking for enthusiastic volunteers to help continue the outstanding success of this race. Whether you’re a veteran volunteer from years past or new this year, we want you on the Powder Keg team. We have volunteer positions for skiers and non-skiers alike. To sign up, please reply to this email with the information requested below. This is a great opportunity to participate in a home-grown event in a rapidly growing sport that features the best skimo racers around. Everyone who volunteers for Saturday will get BBQ lunch, Epic beer, and your name will be in the drawing for raffle prizes. Course maps, schedules, and more information is available at www.wasatchpowderkeg.com. The Wasatch Powder Keg is a great event because of volunteers like you who help organize and conduct the race. If you have friends or relative that are racing and you are not this is a perfect way to show your support for them. It’s the BEST feeling in the world to see a familiar face at a checkpoint cheering you on when your motivation and stamina are starting to flag! A picture of your smiling face! Hope to see you all at the Powder Keg! 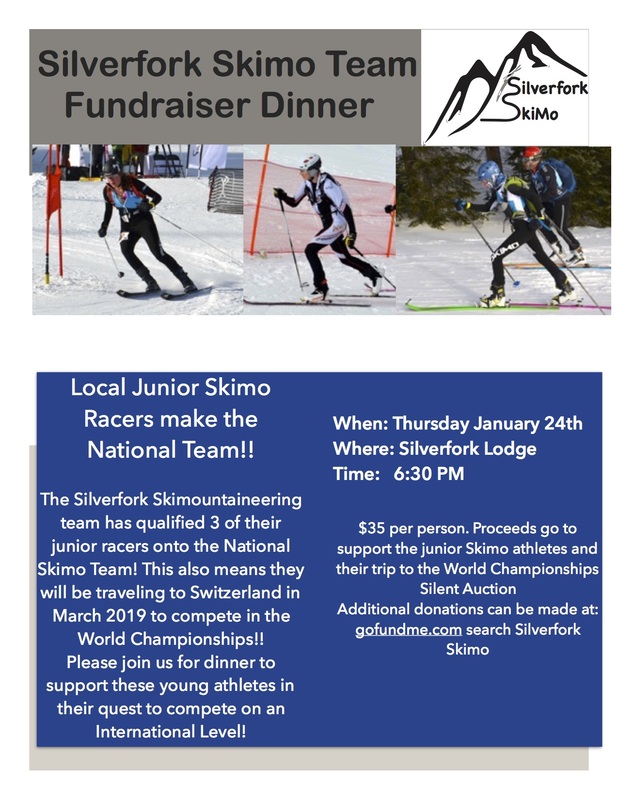 Please come out and support the Silver Fork Skimo Team Thursday, January 24 at the Silver Fork Lodge in Big Cottonwood Canyon! Several of our young racers are vying for spots on the US National Team bound for the World Championships in Switzerland, and this will be a fun event with dinner and a silent auction with prizes from our sponsors DPS, Voile, and Black Diamond. Please come out and support some fantastic kids and consider contributing at our gofundme page. Hope to see you there! We have an awesome 2 loop course this week that we will be using to earn the most points possible. We have an upper loop and lower loop; do both or any combination to get the most points you can in an hour. Racing starts part way up the Great Western chair. Get up there early to make sure you make to the 7pm SHARP start. It will take you about 10-15min to get to the start. Brighton is open for night skiing now, so Alpine Rose is open for us to have an after awards party! We have some great prizes and giveaways from all our great sponsors Dynafit, Skimo.co, DPS, Gnarly Nutrition, and Voile. Make sure you park over by Milli chalet and that you have signed the waiver for Brighton and the Utah Skimo waivers for either adults or kids. Don’t forget your helmet and headlamp! Skin the Turkey is on at Brighton! The first race of the Utah Skimo series is happening this Thursday morning at Brighton Ski resort starting at 8am. Come on up and make some room for the turkey later! 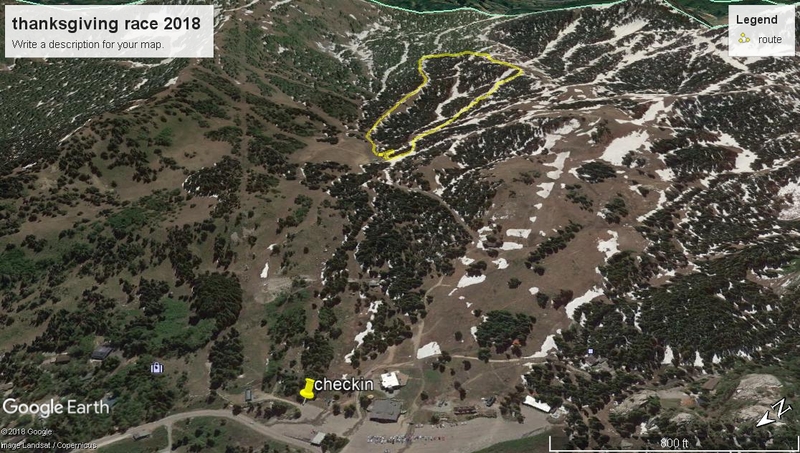 The course will start and finish at the bottom of the Snake Creek lift due to snow amounts. We have a short 500′ course that you will do several loops on. Because of this, you will have to skin to the start line which will take 15-20 minutes. The race will start PROMPTLY at 8am, so plan on being to Brighton early to check in and skin to the start. Our suggestion is to be up to Brighton no later than 7:30am so you can check in and skin to the start. 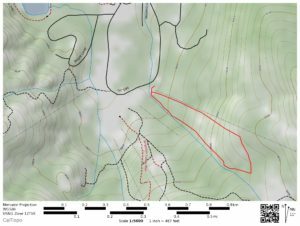 If you have not signed waivers yet, go to the utahskimo.org website and sign the Utah Skimo and Brighton waiver. This will save you some time in the morning so you don’t miss the start. Memberships can be done online on the website before you come up. Remember to park by the Milli Chalet and walk over to Great Western lift for check-in and to start skinning. We will have awards and a raffle at the Alpine Rose afterwards. See you there!